In one of our customer projects we are heavily using Spring Boot in combination with other Spring projects for our microservices. One of the more complex parts of microservices, especially when you are using them as fine-grained as meant to be, will be the fact that you need to setup and maintain the connections between all those services. In Spring you are typically doing this using some way of externalized configuration like property files. But even then, it can become quite a challenge when you need to connect with for instance 20 other microservices. To make it even more complex you definitely want, especially in cloud based solutions, something like scalability. Actually, this should be accomplished by running just another instance of your microservice. They are self-contained, so they just need some basic configuration like setting the port-number. But then you also need something to load-balance the different microservices serving the same purpose. And to be honest: I don’t care about the location and port! I just want a service which offers me a certain contract. And at runtime, when needed, I want them to behave differently depending on configuration. So what we are actually looking for is a solution which provides an easy way to do service discovery and even better, can act as a load-balancer and even better, can provide my services with their configuration. This is where Consul.io comes to the rescue. According to their website Consul is a solution which makes service discovery and service configuration easy and is distributed, highly available and datacenter-aware. So let’s discover how Consul plays nicely with Spring Boot! The diagram above illustrates a service, the Dutch City Service, which registers (1) itself with Consul at startup. The Dutch City Client uses this service by discovering its location (2) by requesting it to Consul. Once the client knows about the location, it can call the service directly (3). In the following paragraphs I describe how we will realize this application by first setting up Consul, followed by creating and registering a microservice in Consul using Spring Boot. We will then learn how to discover and user this microservice from a client using Spring Cloud. Finally we will see how we can scale out and load balance our microservice in different ways. The following steps will guide you through the installation of Consul either using Docker or as a native installation. For a native installation you can download an OS specific version of Consul here. It will come as a zip-file which you need to unzip to your preferred location. After installing the OS appropriate version you can download the Consul Web UI from the same page. The Web UI comes as a zip-file which you can extract to the installation directory where you’ve installed Consul. Be aware of the fact that the way we run Consul for this tutorial is not the advisable way! After you’ve started Consul you can check if it is up-and-running by accessing the web interface on http://localhost:8500. 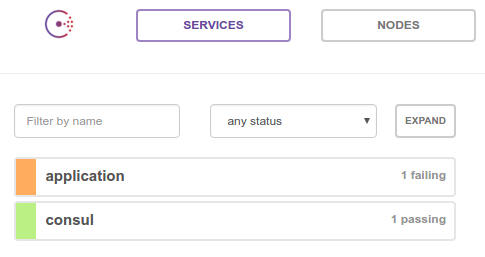 When you first open Consul it will directly open the Services menu. This page will give you a view of Consul’s service registry by showing all the registered services and their current status including Consul itself. The following steps will guide you through the creation of the Dutch City Service and registering it as a service in Consul’s service registry using the Spring Cloud Consul project. Search for dependencies: RS (and select ‘Jersey JAX-RS’). Afterwards click the “Generate Project” button and save the dutch-city-service.zip file. Extract this zip-file and open the Maven project (by importing the pom.xml) in your favorite IDE. At runtime both classes will provide a REST endpoint accessible at the context path ‘/rest/city/capital’. Calling this endpoint will give you a JSON object with all capital cities of The Netherlands. Now open the URL http://localhost:8080/rest/city/capital and you should see the capital cities. Unfortunately the service doesn’t have the expected name and it is failing. Let’s fix the name issue first! To do this we need to add the entry spring.application.name=city-service to the application.properties. By adding this property you specify the name of our Spring Boot application which will be sent to Consul when the service is registered. After restarting the application and refreshing the Consul Service page you will see this new name appear. Also the logging should show the name used during registration. To fix the failing issue you first need to understand what happens when a client registers with Consul. When registering it provides meta-data about itself such as its host, port and health-check URL. During this registration process a HTTP Check is created by default. This check instructs Consul to hit this health endpoint every 10 seconds by default. If the health check fails, the service instance is marked as critical. In the logging above you can see this meta-data. Try to open the health check URL as can be found in the logline or click this link. As you will find out our application doesn’t expose it’s health yet. After another restart you will notice that the service is now passing the checks and showing green on the Consul Services page. As you can see in the logging of our dutch-city-service a number of extra endpoints are enabled on which you can get extra information about your application. One of these endpoints is the /health endpoint. Now that we are able to register services we also want to consume them. The following steps will guide you through creating a client for our newly created service. Search for dependencies: Web (and select ‘Web’). Afterwards click the “Generate Project” button and save the city-client.zip file. Extract this zip-file and import the Maven project into your favorite IDE. The CityRestController will actually get the capitals from the previously created REST controller using Springs RestTemplate and return this data to the caller. In order to be able to run this client together with our service we need to change its port. We do this by adding server.port=8090 to the clients application.properties. Now try to connect to this URL http://localhost:8090/city/capital which should list all the capital cities as well. No surprises so far! The only problem is the direct connection to our dutch-city-service. Of course we can externalize this connection details, but it still remains a fixed way of coupling which, in most cases, will need a restart to effectuate a change. So this is the moment to introduce service discovery. In this case we want our city-client to discover our dutch-city-service. If you browse to the Consul Services page you will notice that our client is also registered (using the name ‘application’). This happens because of the @EnableDiscoveryClient annotation we’ve added. You could solve this by setting a proper name into the clients application.properties, but we can also disable service registration for the client as we only need the discovery part. We do this by adding spring.cloud.consul.discovery.register=false to the clients application.properties. After restarting you will notice that the client is no longer registered on the Consul Services page and requesting the clients endpoint still gives a list of capitals. If we now restart our dutch-city-services and request the client endpoint multiple times you will notice that the “/city/capital called” logline only appears in the logging of one of our services. This happens to be the service which fully started first. The way to solve this is by using the loadbalancing feature of Spring Cloud. Now let’s restart our client, do a bunch of requests and check the logging of our services again. Now you should notice that the load is evenly spread across our different service instances. We’ve created a client performing client-side load balancing on requests to our service using Spring Cloud. As you’ve hopefully discovered it is really easy to get up-and-running with the Consul service registry using Spring Boot in combination with Spring Cloud. Tutorial is just awesome. But i need something more.Is it possible that we can expose multiple rest web services on a single port directly? e.g city service is running on 8080 and country service running on 8989.Both services having different URLs.Is it possible to expose these two services on a single port ? So that consul automatically decides to which URL+Port request belongs. I do not totally understand what you really want to achieve or mean by exposing both services on the same port. Since you can’t run both services on the same machine on the same port the only option to expose both endpoints on the same port is to combine those endpoints in one service and I don’t think that is what you want. Moreover you don’t need Consul in that situation. Aren’t you confusing Consul with a proxy or router or even an ESB which can decide on the URL pattern to which service the requests should be sent? I found the solution. Actually i used zuul proxy server for instance discovery on consul(That is what i need). Different instances of services in consul are registered with different ports. You can configure zuul to search these instances and redirect the request.Ultimatly behind the scene request goes to different ports as required. why does it not using bootstrap for registering ? Very nice simple article. There are minor issues in the instructions which is self-resolvable. 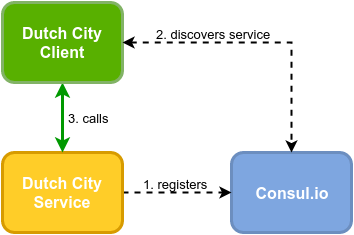 Great article thanks Well explained the service registry,discovery and load balancing concepts. Tutorial is really nice, thanks! Thanks for your comment. I will update the tutorial soon. Really good tutorial on Spring consul!! Keep it up! !